Agreed, but the chances of this are slim to none if the “PHP-blueprint” becomes the “New Paradigm.” To prevent this from happening it is critical to disprove the claims, recognize the threat, and address the matter directly and collectively. We need political and social activism in the same spirit as Abbie Hoffman whose words from three decades ago are aptly accurate. His prescient warnings remain unknown, forgotten, or irrelevant to us today but their accuracy is crystal clear. Few people know the enemy. On April 23, 2015 Dr. Robert Dupont, MD addressed the House Subcommittee on Oversight and Investigations Combatting the Opioid Abuse Epidemic and proposed widespread application of a “New Paradigm” for substance abuse management based on the nation’s physician health program (PHP) model of care. This model is being brandished as “gold standard for addiction treatment” to the drug and alcohol rehabilitation community and general public. The medical literature contains numerous articles claiming the high success rate of these programs4,6,9,10 and they are being promoted to set the “ standard for recovery” as a replicable model to be used for treating “other addicted populations.”11 In his speech before the House Subcommittee Dupont states critics call the expansion “utopian” but many would beg to differ. “Dystopian” would be more like it. There has been an increasing scrutiny of these programs recently not yet covered by mainstream media. The link between the marked increase in physician suicide (which is much more than the oft quoted medical school class of 400 per year is directly related to the FSPHP takeover of PHPs). A recent Medscape article describes the coercion, control, secrecy and conflicts-of-interest between the PHPs and their “PHP-approved” assessment and treatment centers. The simple fact is the majority of doctors referred to these programs do not have a substance use disorder or psychiatric problem but are given one nevertheless. This removes their locus of control and puts the PHP in complete power. Their fate is in the hands of the PHP. The assessment and treatment facilities used by PHPs do not take insurance and require payment up front. It is all out of pocket because if insurance was involved the fraud would have been discovered long ago. The PHPs have no accountability. There is no oversight by medical boards or medical societies and answerability and justification for actions are absent. And as we are hearing the rehabilitation industry itself is unregulated. So too are the junk-science lab tests used in PHP programs as these non-FDA lab tests and the corrupt labs that use them have no oversight form the FDA or any other agency able to hold them to account. It is a free for all. Those ensnared in this web do know the enemy but can do nothing about it. I am hearing story after story of doctors seeking help from their medical societies, law enforcement, the media and the ACLU only to be turned away. Their stories are remarkably similar An increasing number of complaints involving PHPs and the preferred assessment and treatment centers and contracted commercial labs are being reported. A recent lawsuit filed by a doctor against the North Carolina PHP and Medical Board reported on Medscape last week is a prototypical case. The scenario typically goes like this: An accusation is made against a doctor who has had no previous disciplinary history or concerns (alcohol on breath, throwing a surgical instrument) and referred to the state PHP; An assessment is recommended by the PHP at an out-of-state “PHP-approved” assessment and treatment center; the assessment confirms a psychiatric problem or substance use disorder and recommends typically three-months of inpatient treatment followed by a 5-year contract with the state PHP for monitoring. It is becoming clear that doctors who do not fit the diagnostic criteria for a disease are being diagnosed with a disease. There are also complaints of laboratory misconduct and forensic fraud. In truth the sole basis for these claims is a single retrospective cohort study of 904 physicians monitored by 16 state PHPs initially published in the British Medical Journal in 2008.2 In 2009 the same study was published in the Journal of Substance Abuse Treatment3 and deemed the “PHP-blueprint. Methodologically flawed and rife with conflicts-of-interest this study is the sole foundation of all of the claims. Of the 904 participants 102 were “lost to follow up” and of the remaining 802, 155 failed to complete the contract but despite the small numbers this study has been hashed and rehashed to brandish the claims of an 80% success rate physician including subsets of psychiatrists,4 surgeons5 and anesthesiologists6 In his address to the House Subcommittee Dupont, who is a co-author on every one of these papers, claims similar success in a subgroup of opioid addicted doctors. The same forces that have created and sustained the current monopoly of 12-step oriented treatment in America have grand plans through links forged though government, private agencies and the drug and alcohol testing assessment and treatment industry. 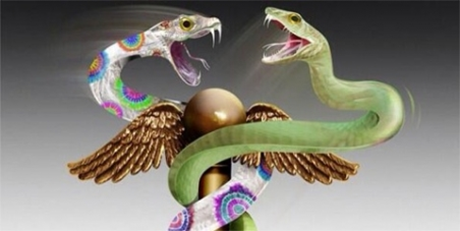 Through a combination of large-scale funding, rhetorical persuasion and moral panics they have gained both tremendous sway and power in the profession of medicine and the collateral damage they have caused is widespread and permanent. They are poised to do the same to others using the same methods and the procedural protections afforded to those currently being tested for substances of abuse in Federal Workplace Drug Testing programs will be removed without your consent or knowledge. I recently heard from someone that these groups are lobbying the Nuclear Regulatory Commission into accepting this model with some resistance. As far-fetched as all of this sounds all one has to do is look. The greatest threat to the civil liberties we seek to protect is no longer a threat but a reality. Examine the documents below and connect the dots to see the coming Trojan horse for systemic application of a flawed substance abuse management program with no evidence base. Medicalization of 12-step will be accomplished when “addiction medicine” becomes recognized as a bona-fide medical specialty by the American Board of Medical Specialties. (ABMS) which is slated to occur within the next couple years. At that point this group will deem 12-step ideology as best practice “evidence-based” doctor recommended care. This will “sanctify” the ideology as medical “standard of care” and can then be imposed on anyone with impunity and immunity. Medicalization subverts the Establishment clause of the 1st Amendment and the propaganda supporting this has already begun. See the 12-step “facilitation” piece below giving the reasoning they will use. This is not facilitation but coercion. The ASAM White Paper on Drug Testing promotes random testing of everyone using the Non-FDA approved tests of unknown validity currently used in state physician health programs. This will be implemented through the healthcare system by removing procedural protections currently in place under federal guidelines. This is sure to be a boon for anyone battening and fattening off the Drug and Alcohol Testing Industry Association or rehab racket gravy train but a burden and pain for the rest of us. The conflicts of interest are unfathomable. Dupont and fellow “Gang of Four” member Peter Bensinger (DEA chief, 1976–1981) run a corporate drug-testing business. Their employee-assistance company, Bensinger, DuPont & Associates is the sixth largest in the nation and managing drug testing for some 10 million Americans including Kraft Foods, the FAA and even the Justice Department. They sell drug-testing management programs. The “New Paradigm” is simply a ruse to get non-FDA approved testing into the wider workplace via loopholes and workarounds. His ties to the drug and alcohol testing and treatment industry are easy to find. Drug testing is a multi-billion-dollar-a-year industry. DATIA [Drug & Alcohol Testing Industry Association] represents more than 1,200 companies and employs a DC-based lobbying firm, Washington Policy. Many of the non-FDA approved tests they are using in the “PHP-blueprint” they in fact introduced to the market themselves with no evidence base. It is reprehensible. And the people who will suffer most in the “New Paradigm” will be those who are already marginal in American society. That’s a given. I have heard from doctors who are gay or belong to a minority group who claim they were referred to a PHP due to discrimination but had no recourse. Medicalization of behavior removes due process as the victimized are simply put in a labeled group and via actuarial logic that safely that removes the underlying prejudice from view by categorization of risk. Discrimination is justified and rationalized. So read the documents below and connect the dots. Then do something about it. Say something. Write something. Do something. The Emperor has no clothes and this needs to be exposed. Either defend what you read below or protest this New Inquisition. We need revolt and Revolution. The Federation Of State Physician Health Programs (FSPHP) regime is simply another front-group designed to force the medical profession in line for the profits of the rehab racket. The FSPHP is the enemy and State PHPs need to be reformed and repaired with transparency and accountability. And to accomplish this the entire long running mess needs to be bulldozed and rebuilt from scratch. Hoffman A, Silvers J. Steal This Urine Test: Fighting Drug Hysteria in America. 1 ed: Penguin Books. DuPont RL, McLellan AT, White WL, Merlo LJ, Gold MS. Setting the standard for recovery: Physicians’ Health Programs. Journal of substance abuse treatment. Mar 2009;36(2):159-171. Buhl A, Oreskovich MR, Meredith CW, Campbell MD, Dupont RL. Prognosis for the recovery of surgeons from chemical dependency: a 5-year outcome study. Archives of surgery. Nov 2011;146(11):1286-1291. There is a very urgent need for a “counterpower” to state physician health programs (PHPs). On average five or six medical students, doctors or residents contact me each week and I want to continue to help them and work toward advocacy and watchdog groups. Unfortunately I am losing ground quickly. We have made tremendous advances in the last year and I am working in many different venues to expose the problems written about here. Those involved in this corrupt system are hoping that I will run out of resources and simply go away and have done everything they can to accomplish this. Without your help this will occur and it will unfortunately occur soon.